They need to have a very strong bond, because when they are sitting on the eggs they can sit there for a week or 10 days waiting for the partner to come back, so they need to have a good partner to rely on. 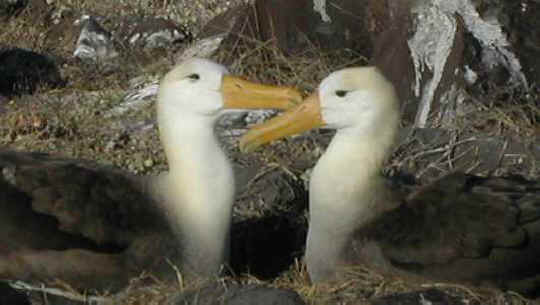 A pair of albatrosses--lesbian albatrosses, that is--had a ménage à trois with a male bird for a few years and now he's gone missing. But before he disappeared he got one of them pregnant! Cue the Unsolved Mysteries music. It all went down at Taiaroa Head, the only mainland albatross breeding colony in the world. Female nesting of this type is anything but typical. In fact, there have only been two instances of it recorded in the past 70 years. "It's quite unusual in the albatross population here at Taiaroa Head to have two females mating together," Lyndon Perriman, the colony's head ranger, told Television New Zealand. For the next six months the new parents will take turns guarding and feeding the chick. They'll swap roles every two days. While one is protecting the chick from predators, the other is out at sea foraging for food hundreds of miles away. “They need to have a very strong bond, because when they are sitting on the eggs they can sit there for a week or 10 days waiting for the partner to come back, so they need to have a good partner to rely on,” Mr Perriman told The Times. The colony currently has 140 royal albatrosses with each having a wingspan of nearly 10 feet. This season, 17 chicks hatched from 17 fertile eggs--a rare success rate.